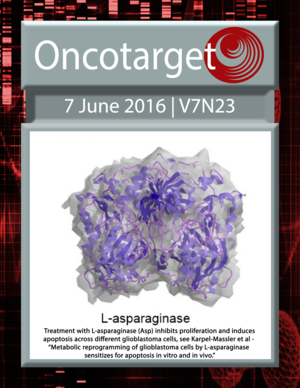 Treatment with L-asparaginase (Asp) inhibits proliferation and induces apoptosis across different glioblastoma cells. See Karpel-Massler et al. Use of estetrol with other steroids for attenuation of neonatal hypoxic-Ischemic brain injury: to combine or not to combine? 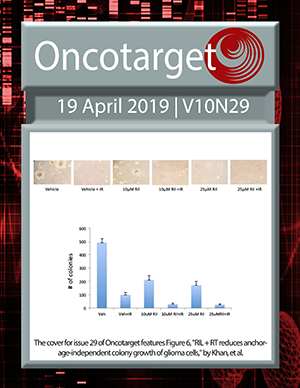 Can an IL13 -1112 C/T (rs1800925) polymorphism predict responsiveness to neoadjuvant chemoradiotherapy and survival of Chinese Han patients with locally advanced rectal cancer? Interplay between myeloid-derived suppressor cells (MDSCs) and Th17 cells: foe or friend?